The feast of the Epiphany is celebrated in the Christmas season and through Matthew’s Gospel we become aware of the visit of the wise men or Magi who come in search of the Christ child so that they might present their gifts. It is interesting that in the homily of an early saint and bishop he preached that “this feast of the Epiphany manifests even more wonders than the feast of Christmas." This is a bold statement but nevertheless this event in scripture raises great curiosity about its details. In the Christmas season what might the wonders of the Epiphany event be in our lives? What can we learn from the details of the journey of the wise men, the guidance they sought, the questions they asked, the gifts they brought to Christ and finally the decision they made to return to their home country by a different route? The identity of the Magi begins with the fact that they come from the East. It is not clear if they are from one location in the Orient or from several. We also see from scripture that we do not know exactly how many there were. This is where tradition begins to take over from scripture and we see them depicted as being three in number, coinciding with the gifts which they brought gold, frankincense and myrrh. They are also traditionally pictured as being black, white and brown in representation of all the peoples of the earth. The reference to their being wise is also assumed to mean that they were astrologers and thus familiar with searching the stars of the heavens for meaning and direction in life. This also suggests that they were themselves pagan and unbelievers in the mysteries of God. Other traditions also referred to them as the “Three Kings” who were coming to give homage to the “infant King of the Jews”. In this journey they first come to King Herod with questions which he could not answer and so he turns to the chief priests and scribes to learn that scriptures had foretold of such an event and that the Christ “would be born in Bethlehem of Judea”. With this new insight from scripture the wise men continued to follow the familiar sign of the star until it halts in front of the place where the child was. As their gaze comes to rest upon the child with his mother Mary they fall on their knees and give him homage. They offer gifts not to an infant king but to one who was God. The word “Epiphany” and these events recorded in Matthew’s Gospel have come to mean a manifestation or a showing forth of the Christ-child to the nations. It reveals how God enlightens the hearts of all people and how he helps them to discover his revelation, to search out this Truth and to be faithful to it. The journey of the wise men begins as a search for Truth through the simple observation of nature. The use of our human reason in the search for Truth continually poses questions about the origins of life, the universe, the nature of the human person and the search for God or ultimate meaning. In many ways it is the journey of humanity in all of the ages. There is no doubt that our present society is a generation of seekers. The fields of research have multiplied. Through technology the modes of communication have become global in reach and the access to information made easy through the internet. It is an experience of tremendous power and control which seems transformative but which can leave us feeling empty and ultimately unfulfilled. The irony is that in the shadow of this experience of searching it seems that many parts of our world desire to do this without reference to God. The wise men are a model of humility in the face of the search for Truth. They seek the guidance of scripture and enter into dialogue with the chief priests and the scribes. It is this gift of faith and its insight into Truth which was essential for the wise men on their final leg of their journey. They did not abandon the star and the use of their reason for it also directed them to Bethlehem. At the end of their searching the gift that they received was the gift of faith in God and this was acknowledged and symbolized by the act of falling on their knees before Christ. In my experience as a student learning the science of engineering I was fascinated with the acquiring of knowledge through observation and of designing new technologies which had the potential to transform society. However this natural desire of enquiry also led me to ask basic questions of my faith and what I was ultimately being called to do in life. As a priest and teacher I have also witnessed this desire to question the reality of our faith in the young people of today. Some do it openly in dialogue with the Church and others secretly and silently. The questions are far ranging. Is there a God? What are the origins of human life in the face of science? Why profess the Christian faith? What does Christianity have to offer which the great religions of world don’t have? Why go to Church? Why fall on our knees and give homage to God? The feast of the Epiphany offers us the opportunity to raise such questions and to see that the Church desires to enter into dialogue in the search for Truth. To show that faith and reason are not incompatible -- as John Paul II stated in Fides et Ratio -- but in searching to answer the questions of life they are necessary in our search for Truth; provided that it is done in this spirit of humility at the service of humanity. The challenge which we face today is that society is often beginning their search for Truth from secular origins without any reference to God. It is important for the Church to search out the signs of Christian faith in our society and to point to these so that people can begin their journey as the Magi did with a reference to God. It can be much easier for us to critique society and to point out the weaknesses of its lack of foundation on the Christian tradition rather than being a Church that is open to the questions that are posed and to offer ourselves as guide. This is very important for our young people and their search for truth. It might be important that we see in this present generation of young people not only seekers of information, or surfers on the web, but a generation of magi who are seeking God. The gifts that the Magi present to the Christ child have also received the interpretation of tradition. St. Leo refers to them as symbolic gifts which bear witness to the Truth: incense for God, gold for the king, myrrh for the one who is to die. They point to the belief that the fullness of Truth is revealed in Jesus Christ. That he is the son of God, he proclaimed the fullness of God’s kingdom and that he was the Savior who was to die. In essence the gifts of the Magi are symbolic of their witness of faith and belief in God in their search for the Christ child. Their gift of faith is also witnessed in their act of worship. In falling to their knees this not only becomes a sign of faith, but an active sign of worship and the demonstration of their faith. 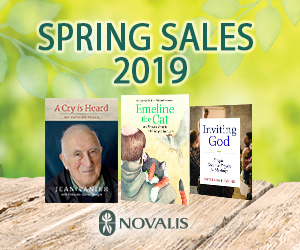 In our present day there is growing desire to search for a relationship with God and to express a spirituality which is personal, private and devoid of a communal expression. The Magi provide for us a reminder that our worship and belief in God is not simply a private matter but one in which we express through the act of giving of witness and of offering our gifts to God and others. In Christmas when we see this witness of faith in others it is an opportunity for us to receive this gift through the gathering of the people of God in Church. The celebrations of the Advent and Christmas season provide for each of us opportunities to express our belief and worship of God but to experience and receive the gift of faith that we see in the lives of our brothers and sisters. 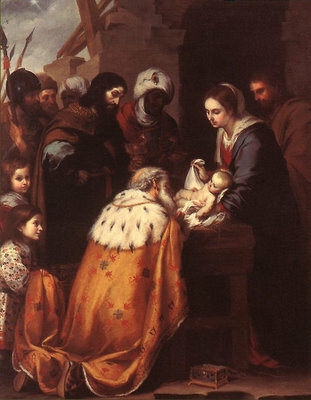 Image: Adoration of the Magi, 17th century, by Bartolomé Estéban Murillo.